According to Matt Schroeder, regional fisheries biologist at the AGFC’s Mayflower Regional Office, there are many aspects of a fishery beyond the control and capability of the AGFC to manipulate. There are, however, some factors the AGFC can address to try to improve the fishery for anglers. Because of its primary purpose in flood control, the lake’s water level cannot be manipulated to promote the fishery by flooding shoreline cover during the spawn and lowering it after young-of-the-year fish have grown larger to establish next year’s shoreline vegetation. But that doesn’t mean biologists cannot do anything to improve the lake’s fish habitat. The new fishery plan also will continue to focus on establishing native aquatic vegetation on Greers Ferry where possible. Aquatic vegetation in a reservoir can add an exceptional amount of spawning and nursery habitat for fish, but it is extremely difficult to establish in reservoirs with highly fluctuating water levels. Efforts to establish aquatic plants in Greers Ferry, Bull Shoals, Greeson, and elsewhere have been largely unsuccessful so far because of massive annual water level changes, but biologists have not given up and are always looking for a better way. AGFC biologists meet regularly with biologists from surrounding states to discuss strategies that have worked elsewhere, but there are few examples of success in highland lakes. A tried-and-true program initiated by AGFC biologists at Greers Ferry in the last few years is boosting the forage population of the lake through stockings of threadfin shad. The shad are stocked directly from hatchery trucks and from the lake’s nursery pond located at Mill Creek. Forage species stocked in Greers Ferry before this period consisted primarily of bluegill, which also serve as sport fish. In 2015, fisheries biologists evaluated the forage base and discovered that the lake’s threadfin shad population was depleted. Extremely harsh winters and an abundance of predatory fish likely had taken their toll. Biologists immediately made plans to stock a crop of bluegill through the nursery and began researching the possibility of stocking threadfin shad the following year. In 2016, 36,500 adult-size and 563,856 fingerling-size threadfin shad were stocked into Greers Ferry. This was followed by an additional 10,000 adults and 1 million fingerlings stocked in 2017 to boost the population. Pre-spawn adult shad were stocked in the nursery pond and allowed to spawn. The shad were even more prolific than expected, and fingerling production was excellent. Schroeder says many anglers present at the focus groups asked for increased stockings of sport fish, such as largemouth and smallmouth bass in addition to the forage, but the lake’s current situation is a lack of food, not predators. One management practice that has seen controversy over the last decade is the stocking of hybrid striped bass at Greers Ferry. A manmade cross between the native white bass and the non-native striped bass, the hybrid is a much-sought gamefish in some states and has seen popularity with Arkansas anglers at times. However, during recent creel surveys conducted at the lake, only 4 percent of anglers on Greers were targeting white bass or hybrids. 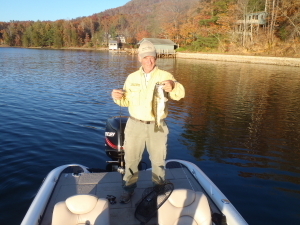 Additionally, a follow-up mail-in survey of willing Greers Ferry creel survey participants conducted by AGFC biologists found that anglers opposed their stocking overall. Ben Batten, chief of the AGFC’s Fisheries Division, says recent research also suggests hybrids at Greers Ferry could have adverse effects on forage at the rate they currently occur. Of particular interest is the hybrid’s ability to switch forage on Greers Ferry in the absence of open water shad populations. The last time hybrid striped bass were stocked at Greers Ferry was in 2014. With the lack of angler interest and the concerns over the lake’s forage base, no more hybrids will be stocked for the foreseeable future. Bass anglers also will note the possibility of a regulation change regarding minimum length limits on largemouth, smallmouth and spotted bass derived from the meetings. Schroeder explains that minimum length limits are placed on lakes when there is an issue with poor or inconsistent recruitment or when the species sees high mortality rates from harvest. It also requires a good growth rate for fish to move up into harvestable size quickly enough that they don’t overpopulate. Schroeder says adding the minimum length limit on spotted bass was part of the AGFC’s current goal of keeping regulations simple. A standard 12-inch length limit will be easier for anglers to remember and won’t penalize any tournament anglers looking to bring fish to the weigh-in. The good turnout at both Greers Ferry public meetings as well as at the recent town hall meeting with Commissioners gives biologists and administrators hope a new resource can be used more effectively in the future — the anglers themselves. Many focus group attendees said they would be willing to volunteer their time to participate in future habitat projects and other initiatives to help the lake’s fishery. Schroeder says habitat projects are an ideal way anglers can contribute to be a part of the solution, and the amount of habitat that can be added can be greatly enhanced. The complete Greers Ferry Fishery Management Plan and management plans for other lakes in the state are available at www.agfc.com/fishmanagement. This entry was posted in Bass Fishing, Conservation on April 5, 2019 by ronniegarrison.